Weekend 2 Cents: Arcane Radio Presents...Darren Evans & Rosemary Ellen Guiley - 'The Zozo Phenomenon' -- Did Insanity Create a Shadow Man? 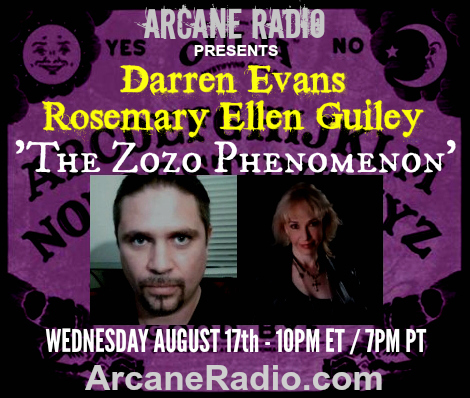 This week we welcome Zozo experiencer Darren Evans and our friend, author & paranormal authority Rosemary Ellen Guiley to Arcane Radio. Darren Evans and paranormal expert Rosemary Ellen Guiley have written the ground-breaking book 'The Zozo Phenomenon.' Darren is a paranormal survivor who learned about Zozo the hard way...and took his story to the world. Darren was featured on 'Ghost Adventures'...as people around the planet responded with similar stories, and some that were even more shocking. This should be a great show! Did Insanity Create a Shadow Man?